Designing and installing the highest quality intruder alarms for Hertfordshire businesses since 2005. 1st Choice Security Systems is proud to offer the region’s most dynamic and capable intruder alarm installations, catering to the needs of large and small businesses alike. We design cutting-edge Hertford security systems from scratch, tailored to the exact requirements and budgets of each client individually. If looking for the total package of peace of mind and unbeatable value for money, 1st Choice Security Systems has you and your property covered. Contact a member of the team today for more information. Crime rates in Hertfordshire generally rest along the usual national averages. But at the same time, specific areas are affected by much higher crime rates than others. In any case, the very worst mistake businesses in Hertford can make is to take things for granted. Even if the area itself is considered comprehensively safe, any gaps in your security coverage could leave you wide open to attack. If looking to protect your business from the on-going threat posed by criminals, you need to take a proactive approach. Here at 1st Choice Security Systems, we design and install bespoke intruder alarm systems for Hertfordshire businesses from scratch. We consider every aspect of the premises in question, in conjunction with the priorities and budget of the business in question. Whatever it takes to provide you with an affordable intruder alarm installation you can count on, 1st Choice Security Systems is here to make it happen. Contact a member of our dedicated support team today for more information. What sets 1st Choice Security Systems apart from other Hertford security system specialists is our attention to detail and commitment to quality. We refuse to offer generic or prefabricated security systems, instead creating custom installations from scratch. We understand and acknowledge the fact that no two businesses are identical – hence no two security systems should be the same. While refusing to compromise on quality, we also do whatever it takes to keep our prices as low as possible. Irrespective of the size or nature of the business, you can count on 1st Choice Security Systems to provide you with an affordable solution. Enjoy total peace of mind and unbeatable value for money, with the committed support of the 1st Choice Security Systems team. 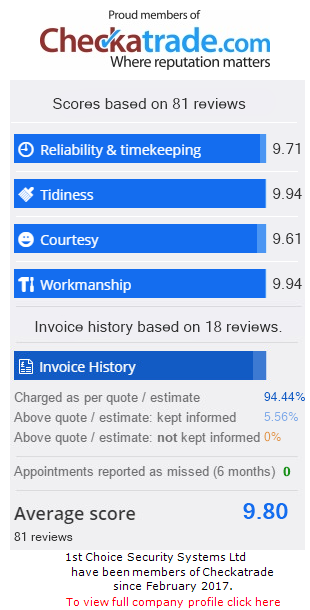 In order to provide you with an accurate quotation, we’ll the first need to discuss your requirements and the specifics of your business premises. After which, we’ll be happy to provide you with an obligation-free quotation you can count on. Whether ready to go ahead or simply considering the idea of a new intruder alarm installation, we’d be delighted to hear from you. Get in touch with a member of the 1st Choice Security Systems team today for more information.